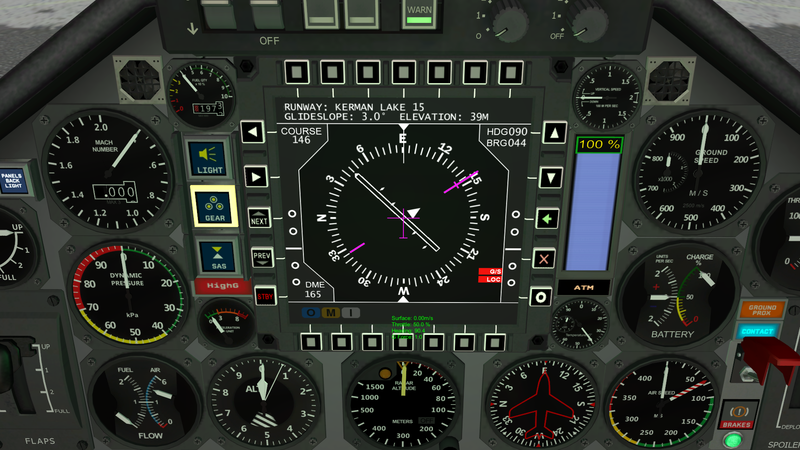 Could you by any chance incorporate @kujuman's brilliant NavUtilities in your cockpits? I think that is a vital flightsystem for navigation and landings. With this your setup will be complete for realistic flights. There is both an analogue prop as well as a MFD page. If you copy and paste the following code into a new .cfg file in your gamedata folder (I put it in GameData/Galen, where I put all my homebrew cfgs), then it will add the NavUtilities page to the ASET MFD - assuming you're using the ASET props/avionics version of this mod. This code was originally written by MasseFlieger for his AKI Modified IVAs mod. Theirs been a problem I installed all the mods needed for this mod and so when I go into my Mk1 Inline cockpit it doesn't work at all it still views as the regular vanilla parts. I too have this issue, but reversed. The inline cockpit has all of your bits and bobs, but the regular cockpit has the stock vanilla interior... I do have module manager. Your RPM patch adds the RPM Computer, and then your ASET patch comes along and adds it again. I'm not sure if this causes issues or not, but it's probably unnecessary. If you're using both ASET Avionics and ASET Props, consider using "ASETPropsIdentifier" as your :NEEDS instead of just "ASET" - it's the plugin associated with ASET Props. It's more specific. Are you just doing fly-boy type cockpits or are you thinking of branching out (e.g. Mk2 Lander Pod)? With a name like your's and knowing your other mods, I can't really see you doing a lander can to be honest, heh. Still.... if you do, I would gobble it up in a second. There was something else I was going to ask, but I forgot...oh well. I'd love to branch out onto other pods, I enjoy making internals and I really do wish to expand from what I usually center around (cars, roads, etc), but I'm going to finish those beforehand. I can probably get around to doing the quick fixes you asked for tomorrow. I've been so busy with car modding, work and other games I haven't actually played KSP since the 1.1.2 release, haha maybe it's time I start playing again. The new Mk2 Inline cockpit could also use your ASET wizardry while we're waiting for the Master Wizard @alexustas to finish updating ASET. Nice work man! A really fun IVA with a lot of detail. Hey guys! Thought I'd let you know I'm going to start making an IVA for the Mk2 inline! After starting to play ksp after a couple months of a dry spell, it's occurred to me that this is something that's needed! Forums arent embedding anymore. Lame. Please tell me if something needs tweaking or fixing. Have fun! That's some really great work! I've been following your progress for a while now and I have to say, I'm impressed with your work. Have you added the update to CKAN? Also, when ASET updates his new and improved IVA props, will you rework the cockpit or will you simply switch and add a few of the more useful props? Thanks again for a really great and useful IVA! Looks great and I can't wait to use it! Are you still config bashing, or do you use the KSP part tools in Unity now? I just got them installed because I wanted to ASET-ify a bunch of mod cockpits, but I can't get things to load due to the dds textures. that is not my cockpit. perhaps you have another mod conflict? there should be no conflicts, but maybe there is a mod I have to add a compatibility fix for. you need ASET avionics too. looks like you just have ASET. I figured it out. The models load, but the textures don't. So long as you don't mind doing everything with shaded wireframes, it's fine. My first cockpit coming soon. The models load, but the textures don't. So long as you don't mind doing everything with shaded wireframes, it's fine. You're doing the Lord's work, theonegalen! From my Google investigation, it seems that Unity can not read dds textures, which is the problem.